I’ve gotten to handle a few different Oris watches over the years, some dive watches, and some more aviation focused. Every one of those I came away liking what I saw (seriously, among other things, their textile seatbelt-clasp straps are one of the best stock straps I’ve ever experienced). Well, as BaselWorld is upon us, Oris saw fit to unleash a new beastie upon us – the Oris Aquis GMT Date. Now, I know what you’re saying – the Oris Aquis is a dive watch! Yeah, it is. But Oris thought, hold on a minute, let’s get funky. And that they did, putting in a different movement (the Sellita SW-330-1) to bring some much-appreciated GMT goodness to the lineup. That gets one part settled, with the handset. Need to indicate things, right? Well, they swapped out your standard divers bezel for a ceramic 24-hour bezel (single tone for now, but one can hope). And, voila, you’ve got a very robust GMT watch. This is a solid path to take. If you think about it, many GMT watches (or at least the ones I’m drawn to) are very much sport watch style, albeit of a slimmer nature to make them a bit less tool-y. But the GMT complication IS a tool. Yeah, I don’t use it as it was intended, but I still have a use for it. So, starting a design with a dive watch (already robust cases and protection) and adding in the complications, it’s a solid plan in my book. If you care about the Oris Aquis GMT Date more for a dive watch, you’ll be covered for depth (with a 300m WR rating), but you won’t be timing any sort of dives with it. As mentioned, the dive timing bezel has a 24-hour bezel now, allowing for a quick way to track a third time zone. Third? Yup, this is because the second time zone is a fixed scale printed on a ring that butts up oh-so-nicely right against the indices on the dial. Or, in my usage, it would be a second time zone. I generally leave the GMT hand set to UTC time (as that’s what the databases at my work run on), but I suppose if you had some hectic travel schedule, then sure, three time zones it is. In the photos, the Oris Aquis GMT Date looks to have a somewhat matted (though, that could be editing) sunray dial in a lovely blue. It’s almost like Oris is trying TOO hard to get my attention, right? But I like it. This gives a crisp, dark layer for those polished and lumed indices and hands to set off against. And here, we’ve got those iconic (at least, they are to me) propeller-style hands. Or, since this is a dive watch, maybe we should call them paddle hands. Regardless, it’s a consistent style that sets Oris apart, and they always get the proportions right on them. Then, of course, we’ve got the standard GMT arrow hand, with a yellow outline around the lime that picks up some of the printing on the lower part of the dial. The Oris Aquis GMT Date is verging on the larger side, with a 43.5mm case, but that’s not totally unreasonable for a dive watch. No word on the thickness, but I’m going to guess we’re somewhere between 12mm and 15mm, if history is any guide. All of this is paired to a variety of straps and bracelets. 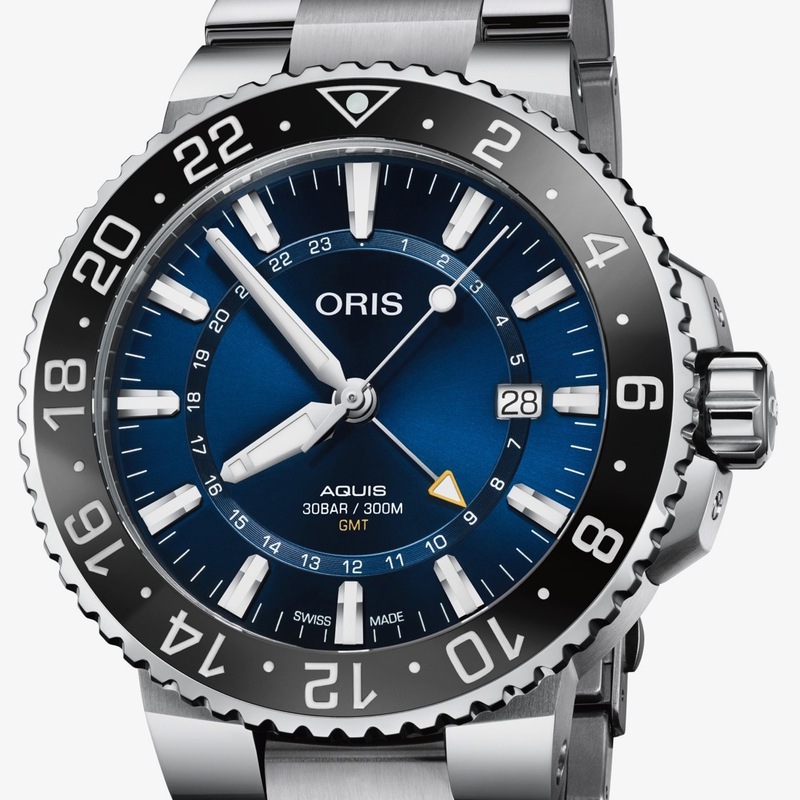 Which, due to the chunky lug configuration, you’re sticking with the stock ones from Oris. So, get the one you want up front, and maybe consider a backup. For me, the bracelet is the star of the show. It’s a rounded off style reminiscent of an oyster-style bracelet, which what appear to be polished out links that pick up the polished surfaces of the case. Would I wear it? Are you kidding me? Blue dial, great handset, GMT complication, and an available bracelet? In a model originally a dive watch? This was all but made for me!